I went to my first non-Washington Capitals NHL game last night. My parents live in San Diego now, so the Anaheim Ducks are the closest thing they have to a local team. Austin and I drove up Interstate 5 for their home opener against the Vancouver Canucks. 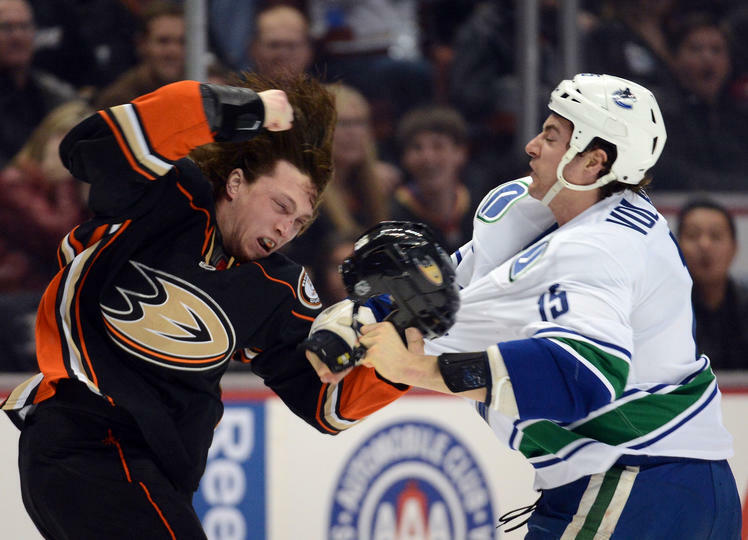 What followed was a hilarious 5-0 rout by Vancouver that featured not one, but three fights. The first thing we noticed upon reaching the Ducks' home arena of Honda Center was how classy and modern it is. The jumbotron may not be as great as Verizon Center's HD wonder in DC, but the concourses look like an upscale hotel. I was amazed to discover when Wikiing the arena afterwards that it's actually twenty years old. I also discovered its first-ever event was a Barry Manilow concert--that's a little embarrassing. Interesting that the exterior of Honda Center still retains a very teal color scheme, reminiscent of the team's days as the Mighty Ducks of Anaheim. Speaking of the Mighty Ducks, I was a little bummed out by the lack of classic Mighty Ducks jerseys in the crowd. There were a handful, but the bulk of fans at the game were wearing their current boring black sweater. The team seems to know it's boring, since they handed out glowing orange styrofoam sticks to make the stands look more colorful. They realize that while an arena full of fans wearing a bright color looks awesome, an arena full of fans wearing black makes the place look empty. So they handed out these bright orange sticks for people to wave around to make the crowd look lively on TV. The fans were loud, but as a Caps fan, I was a little disappointed compared to crowd volume levels at Verizon Center back home. True, their team got spanked, but even when it was close in the first period, the energy level didn't quite measure up to DC. Anaheim's third jersey is a little more colorful than their virtually all-black standard home jersey, and I'm still convinced they plan on promoting the alternate to full home-jersey status soon. I noted last week that the team seems to wear its third jersey whenever possible, and of course they wore it again at the home opener last night. My suspicion was reinforced at the arena, where the team store displayed the third jersey almost exclusively. Most of the fans seemed to be wearing the only two-year-old alternate sweater, too. The game featured way more free handouts than I've ever had at a Caps game. 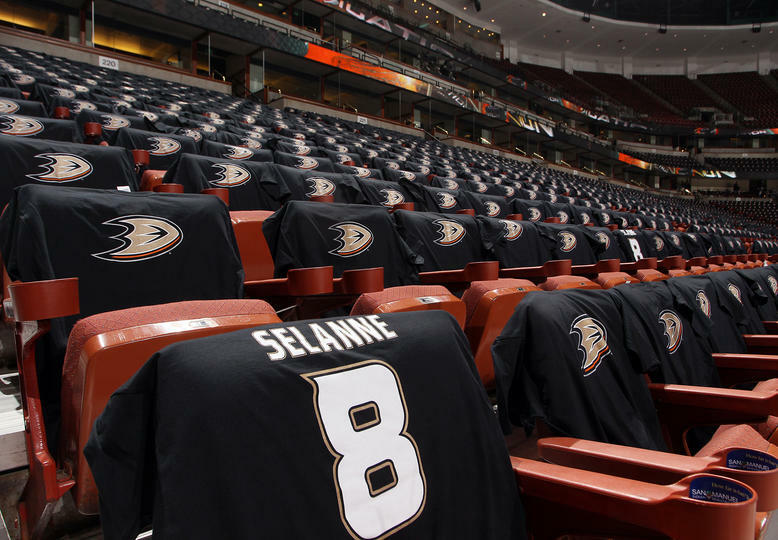 In addition to the orange glowsticks, everyone at the game got a free Teemu Selänne Ducks t-shirt. There were game-worn jerseys and game-used sticks being given out left and right, but best of all... everyone with a ticket to last night's game won $1,000 off Lasik eye surgery. Huzzah! Of the 17,174 fans in attendance at the game, I wonder how many of those people decided to get eye surgery after the promotion. I'm happy hockey's back. The two-hour drive north from San Diego to Anaheim was slightly easier than the four-hour trek it'll take to go see a St. Louis Blues game when I'm back in Kansas City. And today I'm on my way south to Tijuana to see my first Mexican soccer game! Stay tuned for a recap of Xolos vs. Pachuca game.